Appealing to intrepid explorers and adventurers alike, Treasure of Horus invites players to don their fedora and head to ancient Egypt in search of hidden treasures. Created by the gaming maestros at Iron Dog Studio, Treasure of Horus bestows great riches on those who are brave enough to progress into the tombs of Anubis, Weret and Horus were increasing multipliers, wilds and (in the final tomb) scatter symbols await. 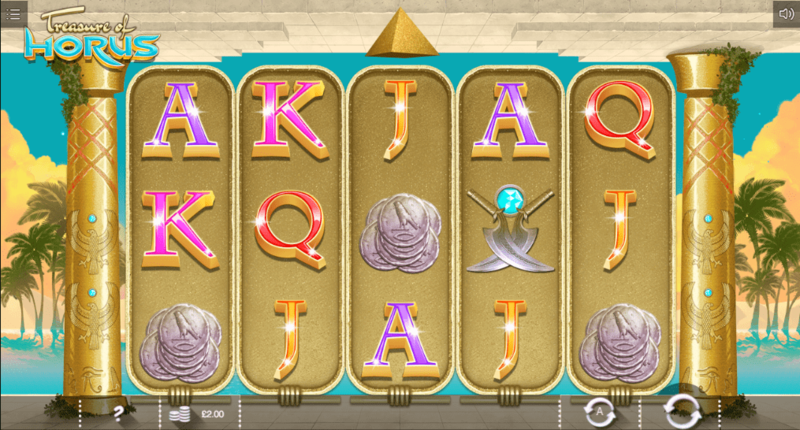 Travel back in time as you play 3D slots like this. Iron Dog Studio are a relatively new online gaming developer who form part of the renowned 1X2 Gaming. By focussing on creating games with personality that cater for all tastes, Iron Dog Studio have a knack for nailing the balance between style and substance, creating great looking games such as Cherry Blast, Rainbow Gold and Neon Jungle excelling in the bonus feature department. The studio is known for going the extra mile for casino operators to make sure no functionality is lost. There are a bunch of other games from this developer here on Wizard so why not try a few more. Free Spins - Keep your eyes to the sky to spot the golden scarab as it bears six free spins to all those it graces. Each spin lures you deeper into the ancient tombs, where treasures including increased multipliers, wilds and finally scatters tempt you at every turn. Scarab Feature - Although scarabs might strike you as something you might want to avoid, this is definitely not the case in Treasure of Horus. Watch as the little blue critters fly across the reels, leaving wilds in their wake. Scarabs can also bestow multipliers on the luckiest of players for divine wins. Scatters - Treasure of Horus bestows great rewards on only the bravest of players. Therefore, scatter symbols do not come into you have discovered the tomb of Horus. However, once inside you will realise that this was a prize worth waiting for. 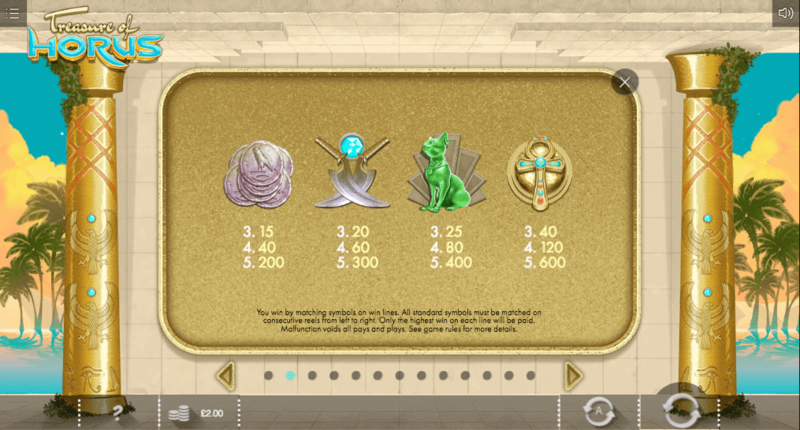 Treasure of Horus is optimised for mobile devices as well as browsers such as Google Chrome and Microsoft Firefox. While playing Treasure of Horus e it’s clear to see that the Ancient Egyptian theme has been carefully thought through in every aspect. Although there is no bonus round to speak of, this actually works to the Treasure of Horus’s benefit as it doesn’t deflect attention from the base game. The suspense that builds during the Free Spin feature is palpable as you descend through the tombs. Those lucky enough to make it to the tomb of Horus can expect some celestial wins. Overall, the quality of games that Iron Dog Studio is consistently producing should make the gaming industry take note. Give this one a try. 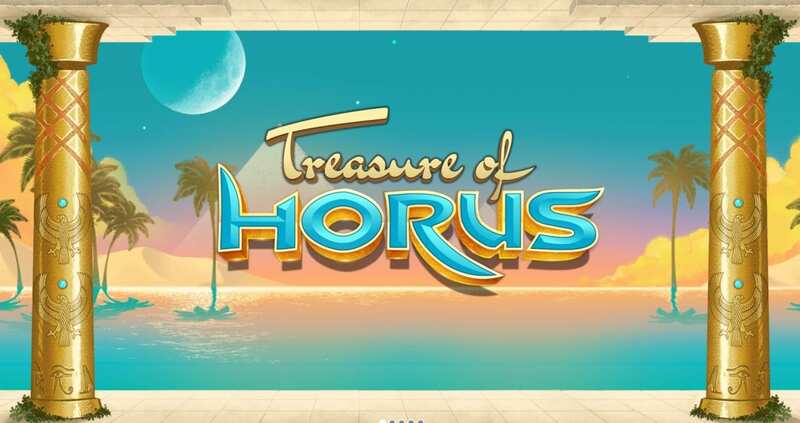 If you liked Treasure of Horus then you might also like Cherry Blast online slots game.